#ArmCandy Alert: These Are The Bags That Caught Our Attention In 2018! The Begum of Bollywood has an enviable Hermes collection and this glossy, black Birkin masterpiece is one of those gorgeous pieces that she has been spotted carrying several times at the airport (probably because it's roomy enough for all her travel essentials). The price of the Hermes Birkin may vary from 6 to 10 lacs! And if that's not enough, you also can't just saunter into an Hermes store and get your hands on this beauty. There are painfully long waiting lists (upto 6 years, in some cases) and buyers are given preference on the basis of their previous purchases. Buy similar black bag at INR 2840 here. Malaika's studded red shoulder bag with gold hardware is making a statement and it has definitely captured our attention. We love how it is adds a fun element to her all-black outfit. Though her arm candy collection is flooded with Pandoras, Birkins and Guccis, lately she seems to be obsessed with Michael Kors! Buy similar sling bag at INR 1505 here. 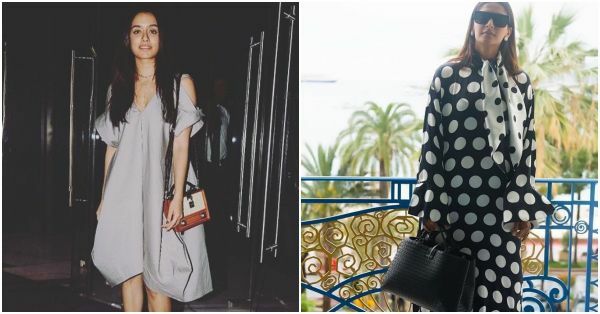 Shraddha's Insta account is proof that this "Vintage Radio Box Bag" from Dolce & Gabbana is one of her favourites, and why shouldn't it be? We love the retro vibe of the bag and the way it compliments her easy-chic style. This is definitely on our arm candy radar! Buy similar bag at INR 599 here. Off-late we've spotted several celebrities endorsing the desi and super quirky Banjara bags from Vipul Shah's handbag collection and Kiara is one of them. The Bollywood actress pairs her mustard yellow, eclectic piece with casual blue denims and a classic white tee, dialing up the style quotient with a dash of sass! Buy similar bag at INR 299 here. The Queen of style stays loyal to the most popular Chanel Boy handbag. In black caviar leather and Ruthenium finish hardware - this flawless piece of arm candy seems to be her preferred companion from the airport to the streets of NYC. Buy similar sling bag at INR 503 here. Yes, Kangana again! Not one to shy away from the classics, Ms. Ranaut has often been spotted with this lavender Miu Miu handbag. It compliments are unconventional style and proves that the Manikarnika actress doesn't follow trends but creates them. Buy similar hand bag at INR 1509 here. Sonam is way ahead of the curb when we talk about celebrities and their bags. From Balenciaga and Paule Ka to Gucci and Goyard, the actor has an enviable collection of handbags, which she flaunts with immaculate flair. Here she is carrying the Bottega Veneta Intrecciato small Roma in black calf leather. Buy similar bag at INR 1047 here. Which celebrity do you think is carrying the most covetable bag? Tell us in the comments section.